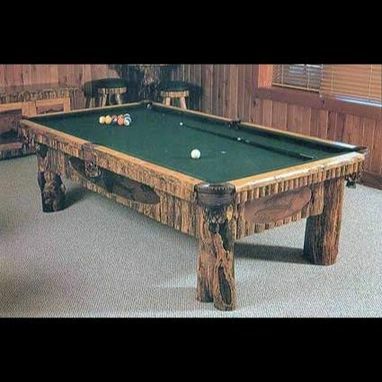 This pool table, with its vertical log-trimmed body and apron, is offered in two styles. This one is the Artwork version and has a custom, etched-copper art insert in the sides and ends of the body. Custom plasma-cut iron artwork and laser art created on wood are also available for an additional charge.